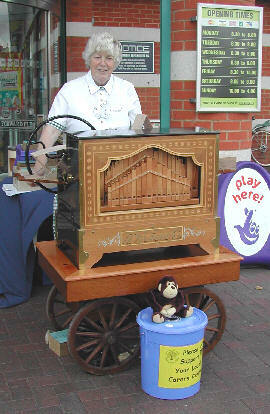 This organ is suitable for indoor or outdoor use and is ideal for shopping areas. There is a large selection of music available. The organ is ‘Hand Turned’, so does not require any electrical power providing. 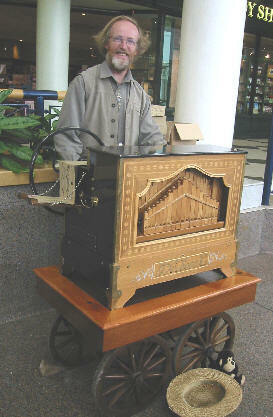 This hand turned street organ was built in 1998 by the famous Belgian organ builders J.Verbeeck. The company was established in 1884 and is one of the few companies to have survived since the commercial use of organs declined. The organ contains 73 pipes, some of which are mitred to make the instrument compact. There are three ranks of melody pipes--bourdon, violin, and open piccolo. The registers are selected by hand. There are at least six 36 key Verbeeck organs based in the U.K. Try looking at www.j-verbeeck.com to see the full range of organs available. Yours truly, playing the 36 key Verbeeck hand turned organ. My mum, playing the organ!